offers breathtaking panoramic views across the azure seas and islands, including vistas of the famous Angthong Marine Park, the Five Islands, and the fishing boats and ferries arriving and departing the island, not to mention some of Samui's most dramatic sunsets. With contemporary open-plan designs by renowned Bali based GFAB Architects, and intelligent, uncompromising living spaces, the villa boasts a distinctive, innovative character that breaks away from the more typical island villa layouts. There are no standalone pavilions, instead, everything is conveniently contained within a single, spacious, multi-level property that merges with the natural topography to offer a unique private tropical lifestyle experience. The rooms open onto the fabulous island surroundings, providing a seamless integration of indoor and outdoor spaces, with a generous negative-edge pool as a centrepiece, its cooling waters merging with the ocean vistas for the ultimate sense of liberating escapism. The modern interiors draw in the stunning views with contemporary luxuries, cutting edge technology and quality materials and furnishings in abundance, creating a supremely comfortable mountain retreat. Lime Samui Villa 2 is an expansive private residence that covers three levels with five en-suite bedrooms, eight bathrooms, a poolside seating sala, spa area with two massage beds and pedicure chair, a fully equipped Life Fitness gym, games room with ‘X-Men’ red pool table, library/study with sun deck ‘floating’ on the reflecting pond. The villa also boasts a deluxe private cinema with a three-metre screen and built-in reclined seating for 12-20 people. Along with its huge 22m pool incorporating state of the art colour changing lights and an underwater speaker, another of the villa's standout features is the expansive Great Room, which opens directly onto the pool deck and combines a sunken lounge living area with plush couches and a dining area with 10 seater teak table and polished white Corian bar adjacent to the fully equipped western kitchen. High-end frameless floor-to-ceiling glass doors allow guests to take in the spectacular views at all times and in all weather conditions, day and night, deciding whether to rely on the cooling sea breeze or air conditioning to maintain a comfortable living environment. The villa sleeps between 12-14 and all the bedrooms are airy, spacious, beautifully furnished, and carefully positioned to take in the breathtaking coastal vistas. All have flat screen TVs, large built-in wardrobes, personal safes, and the en-suite bathrooms featuring walk-in rain showers. Two of the bedrooms also boast indulgent, Jacuzzi baths with waterfall features and therapeutic lights. Outside, sun worshippers have a choice of terraces furnished with comfortable loungers. The lower floor bedrooms also open onto furnished, covered balconies for private tropical moments, while planted terraces and towering coconut palms create an unrivalled sense of cosseted tropical escape. This striking contemporary villa, with its viewpoint location and spacious design, is perfect for families or groups looking for a luxurious, restful private escape. There's enough space for everyone to lounge in peace and comfort around the large pool area with its terraces and cushioned loungers, while more energetic guests can work up a sweat in the gym or do laps in the pool. For private time the bedrooms are hidden away in their own individual spaces, while communal fun and entertainment are guaranteed thanks to the library, pool table and cinema room. While not a beachside villa, Lime Samui Villa 2 is designed to maximize the ocean views and the sense of space freedom more than makes up for any lack of sand. The villa’s well trained staff team is always on hand to serve guests and answer any request, preparing a delicious breakfast daily. A chef is also available for an additional fee to prepare delicious meals throughout the day. A "luxury seater" (Isuzu Mu-7) comes with a driver, all inclusive in the daily rates (capacity 6 passengers plus a driver), which means it's easy to explore everything Samui has to offer – from waterfalls and elephant rides to nightlife and boat trips to the outlying islands that pepper the villa's amazing views. 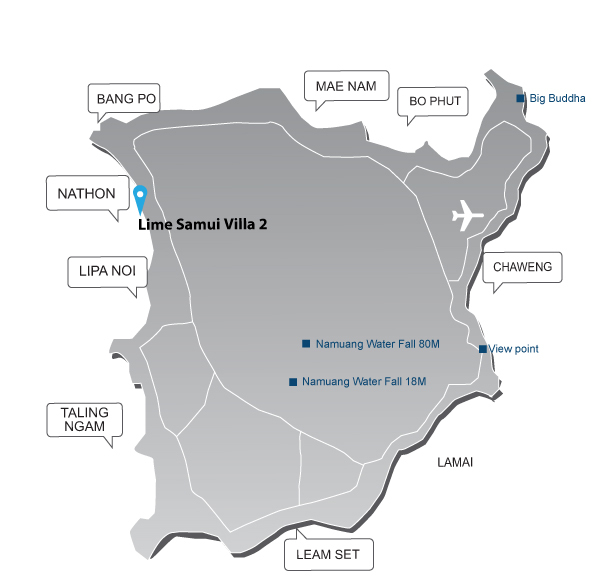 Part of the 12.5 acre Lime Samui villa development, situated in the coconut clad heights above Samui’s picturesque west coast, Lime Samui Villa 2 is in a secluded, peaceful location about 10 minutes from the town of Nathon. The town offers a choice of simple shopping and dining options, while for more sophisticated entertainment seekers, the excellent beachfront and hillside restaurants and bars at Four Seasons are a 10 minute drive away and world famous Nikki Beach club is around 20 minutes from the villa in Lipa Noi. Daily rates of 5 bedroom start from US$ 1,350 to 2,200 depending on season. Reduced occupancy rates of 3 bedrooms available from US$ 1,150 to 2,200 depending on season. 2 Jacuzzi baths- one with ozone lights/waterfall. In-house SUV (Isuzu Mu-7) can be used during stay, fuel on guest account. Also a 11-Seater Luxury Van (driver + 10 passenger) can be shared between Lime villa 2 and Lime villa Spice 3 *subject to availability and conditions.